The Structured Keywords panel in Photo Mechanic allows you to add hierarchical paths of keywords to batches of selected photos in a few keystrokes. Not only does hierarchical/Structured keywording allow us to quickly apply keywords, it also allows those of us who need giant keyword vocabularies to manage big keyword lists without any major loss of sanity. In Photo Mechanic, go to the Image pulldown in the main menu and choose “Structured Keywords Panel…”, or press CMD/CTL+Option/ALT+K on the keyboard. This will open the Structured Keywords dialog. At the top of the dialog, make sure that “Exact Match” is unchecked and enter “tort” in the search bar. Press enter or click on the ‘Find’ button. Photo Mechanic 5 ships with a controlled vocabulary of animal keywords from ControlledVocabulary.com. “Tort” should return a pop-up dialog offering several choices of tortoises. I chose the “texas tortoise” for the illustration, but one turtle is about as good as the next for our purposes here. In Find results, Photo Mechanic offers up all the hierarchical keywords paths that include your search term. Double click to choose one. The Structured Keywords dialog will now display a bunch of keywords in a hierarchy much like the way a file manager would display folders and files. Just now as I write this, it occurs to me how much the dialog looks like the multi-column view of Finder, the Macintosh OS’s file manager. If we click on our “texas tortoise” keyword and apply it, we’ll get a lengthy path of keywords, starting with “animal”, on down through to the turtle in question. The keywords in green in the hierarchical display are synonyms. If we so choose in our settings, we get those, too. So that’s what we’re after. We can find a keyword in an awkwardly large keyword vocabulary, apply it to a batch of photos with a whole slew of taxonomical antecedents, with an extra helping of synonyms thrown in for good measure, and do all this in a matter of a few seconds. I keyword rather sparingly, but I’ve got to admit. This is pretty impressive. At the top, we have the Find function. We’ve already seen that we can search for a partial string instead of a complete keyword. Or, if we get unwanted behavior, we can require complete words with the “Exact Match” tickbox. We can navigate around in the multi-column view of the keyword vocabulary, just like we can in a file manager or in Photo Mechanic’s Navigator pane. Keywords in green are synonyms. Greyed out keywords are Categories, or labels. These help with organization in the vocabulary, but are not applied to our metadata. Below the multi-column keyword management pane is a bar-like field where the chosen path appears. Below that is a field called the ‘Collection’. In this field, we amass the, well, collection of keywords that we will apply to our pictures. Above the Collection field, to the right of the path field, we find two buttons. 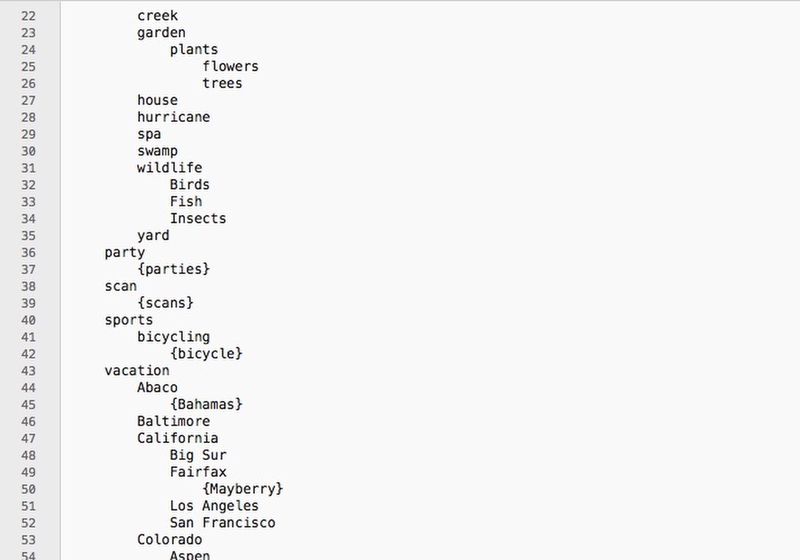 One adds the selected keyword and everything to its left (above in it the hierarchical path) to the collection. The other adds only the selected keyword. A list of keywords to be applied can be compiled in the Collection field. (And you can type in here, but don’t) Remember to clear this field! You can type in both the path field of the Collection field. But you know how I feel about that: We should choose keywords, rather than type them, if at all possible. To the left of the Collection field is a ‘Clear’ button. I sometimes find myself forgetting to clear the Collection and I end up applying the keywords and I want, as well as the collection from the last batch of pictures. Be forewarned. The ‘Clear’ button is your friend. If you add two paths of keywords that contain duplicate keywords to the Collection, Photo Mechanic has got you covered: It will zap the dupes, so you’ll have a tidy little flock of keywords. If tidy is a really big thing for you, the ‘Sort’ tickbox does just that. It sorts. Alphabetically. At the bottom of the dialog on the left are some settings. ‘Apply to:’ has a pulldown that allows you to apply your keywords to either the Keywords field or the Caption. This is a real thing. There are workflows where you want to append keywords to the Caption field. I know this because I worked in a situation where that was often the case. Next to the ‘Keywords – Caption’ pulldown is the ‘Append’ tickbox. Most of the time, you will indeed want to append your keywords to whatever may already be in the Keywords field (or Caption) Sometimes, you want to overwrite. The important thing is to be aware of whether or hot Append is set. Glance at this tickbox often. The ‘Double-click:’ pulldown allows you to choose what a double-click on a keyword will accomplish. I like it to add the whole path to the Collection, but it’s a matter of taste. The next pulldown chooses how synonyms will behave. Generally “Apply synonyms along entire path” will be your default, but here you can control which synonyms will be applied, or turn them off altogether. The ‘Separator’ tickbox is a little confusing. It does not mean commas. You’ll get your commas between keywords with it turned off. It is about pipes. You may specify pipes between your hierarchical keywords. For the life of me, I can’t imagine why you would want that. But it must be important to somebody or else it wouldn’t be here. The lower right corner of the dialog is taken up by a set of buttons that will apply the selected keyword, the current path, or the accumulated keywords in the Collection, to however many pictures you have selected in your Photo Mechanic contact sheet. Click. Done. Very cool. Apply buttons and import/export functions in the Structured Keywords dialog. The ‘Merge’ function allows you to add new keywords to the currently loaded list. This is a great thing. If you update your list outside of Photo Mechanic, or you download an updated controlled vocabulary from the interwebs, you can merge it into your existing list. More on using ‘Merge’ in a minute. How do you edit, manage and update your keyword vocabulary? You can edit your keywords inside the graphical interface of the Structured Keywords dialog, or outside of Photo Mechanic by editing a text file. Real-world, you’ll probably do both, depending on the circumstances. You can edit your controlled vocabulary/structured keywords list with a right-click, right in the Structured Keywords panel. You can also click in an empty space in a column to add a keyword, and customize it from there. If you need to make piecemeal edits or add one or two keywords, editing in the Structured Keywords dialog is the convenient way to go. You can easily see what you are doing, and you’re probably already there in the dialog. On the other hand, you can edit a text file and load or merge it into your keyword vocabulary. The Photo Mechanic format for structured keywords is a simple list of keywords, one to a line, in a text file. Keywords to appear in the left hand, topmost level are at the beginning of a line. Keywords to appear on the next level down are tabbed in one tab. A keyword that appears one level down from that one will be preceded by two tabs. And so forth. Synonyms are one level down (the next line and one tab to the right) of their parents and are enclosed in curly brackets. A structured keywords text file is formatted with tabs and brackets. Categories (labels) are enclosed in regular straight brackets. I like to add a tilde to labels so it’s more obvious in the dialog that they are indeed labels. But the tildes you see in my illustrations don’t do anything. They just “label the labels”. If you’ve started building your controlled vocabulary as a flat text file, it’s a pretty simple matter to make a copy of it and go through it arranging keywords into levels with tabs and adding synonyms or changing keywords into synonyms. Add labels as needed and you’re done. Then make a backup copy of your existing keywords with the ‘Save’ button. Load your keywords list and see how you did. If something’s not as you intended, just go back and have another go. It is seriously not brain surgery. (Remember too, that your keyword list, especially at first, shouldn’t be more than a couple hundred keywords long. (Or maybe much shorter.) So this isn’t going to take hours. In the video version of this post, I take a flat keyword list from the Edit Keywords dialog and merge it into the hierarchy of my structured keywords. The only tricky part was making sure that the items above where I wanted the new bit to go in the hierarchy were keystroke-for-keystroke identical with what was already there. Otherwise, Photo Mechanic wouldn’t have known where to put the new hierarchy. It’s easier to see than to read. Check out the video. Most professional librarians will say that you shouldn’t go more than three, or maybe four, levels deep with your hierarchy. (Real levels. Labels don’t count.) There are specific cases where taxonomies need to go deeper than that. But, in general, we should follow good advice when it’s given. You can call a different version of the Structured Keywords panel from the IPTC editor, on either a picture in a contact sheet or on the Stationery Pad. This version is the same as the bigger one we’ve been talking about, except that it doesn’t have the ‘Apply to selected’ buttons, just an ‘Apply’ button. That makes sense, as in those places, you can only act on one object at a time. But the big news here is that you can apply structured keywords to the Stationery Pad and from there do anything you can do with the Stationery Pad, or even add structured keywords to templates. In the video version of this post, I talk about using the Stationery Pad and the Find and Replace dialog to fix keywording mistakes – in the event that you one day make some. Many people are using Photo Mechanic ahead of Adobe Lightroom in their workflow. Presumably, keywording would be done in Photo Mechanic. But if your workflow should happen to include any Photo Mechanic – Lightroom – Photo Mechanic round trips and you apply hierarchical keywords in Lightroom, there is a quirk you should know about. Lightroom has a feature whereby hierarchical keywords remain hierarchical even after they’ve been committed to images. Why this might be desirable is open to debate. How Photo Mechanic reads hierarchical keywords saved in Lightroom. Adobe implemented this by creating a proprietary field in the XMP data block that holds each hierarchical node as a separate keyword in that field. So animal > cat > tabby looks like: “animal, animal | cat, animal | cat | tabby”. 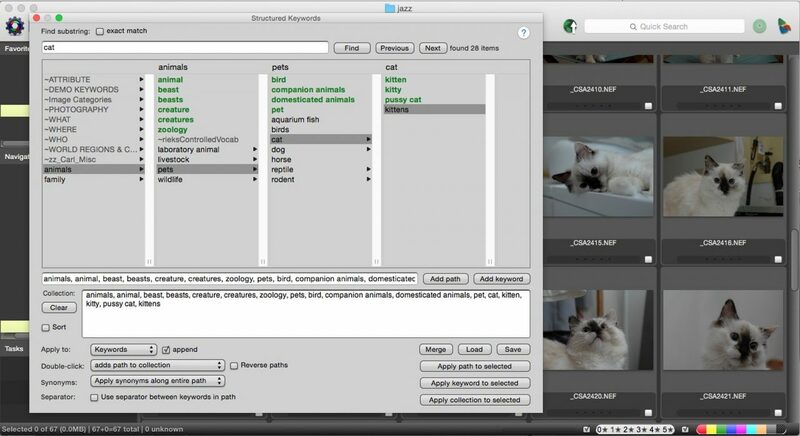 Lightroom also saves “animal”, “cat”, and “tabby” as normal keywords in the regular keyword field. Any keyword that is applied as a hierarchical keyword in Lightroom gets this treatment. Flat keywords from Lightroom are written as normal, flat keywords. UPDATE: Correspondence with a reader – thank you Jed! – has reminded me that if you export images that have Lightroom hierarchical keywords from Lightroom, you can choose in the Export dialog to not export the special Lightroom hierarchical keywords field, thus leaving the exported file with only flat, industry-standard keywords. So, if you go that way, this can be a non-issue for exported images. Photo Mechanic’s developers had to then figure out how they would deal the extra field full of information. While it’s probably just redundant, there might be something precious there. So, Photo Mechanic reads the content of the proprietary Adobe field and displays it in the keyword field in Photo Mechanic’s interface. If you commit an edit to the metadata of such a picture in Photo Mechanic (any field, not necessarily Keywords), Photo Mechanic will then write all the untidy verbosity to the keywords field. Our cat example would look like: “animal, cat, tabby, animal | cat, animal | cat | tabby”. That’s ugly, but the main thing is that – as far as I know anyway – it’s harmless. Keywords are just helper search terms that return a picture to a search that doesn’t hit in the caption. It doesn’t matter that “animal” appears three times. Here’s the output from ExifTool on a photo that had proprietary Lightroom hierarchical keywords. Then, metadata was edited and resaved in Photo Mechanic. The repetitive Lightroom keyword nodes are now saved to both normal keywords fields, as well as Adobe’s own special field. This is ugly, but it shouldn’t be harmful. Photo Mechanic filters out duplicate keywords, so if a photo that has hierarchical keywords from Lightroom goes back to Lightroom and then around through Photo Mechanic again, it won’t gain additional copies of the Lightroom-ish keywords. Photo Mechanic’s anti-duplicate functionality will step in. So again, ugly, but harmless. There you have it. The trilogy is complete. For Photo Mechanic users anyhow. We’ve considered how to plan an effective keywording strategy and we’ve learned how to use Photo Mechanic’s powerful keywording features to actually get keywording done. A few posts down the road, I’ll come back with a HOW-TO for keywording in Lightroom. How are you doing with keywording? Have these posts helped? Do you have tips or insights to share? Let us know in the comments.